1. Create an article for a school's newsletter that addresses the common discipline and parenting issues for parents of children of the age group in question. Include practical advice to parents by describing activities and attitudes that are helpful with the task of parenting. Why Does Parenting Take So Much Energy? Can You Work toward Rhythm with an Infant? What about Going Back to Work? How Long Do Children's Senses Need Protecting? Separation Anxiety and "Helicopter Parenting"
As mentioned at the start of the previous chapter, having a rhythmical home life will eliminate 80 percent of your discipline problems, so please don't read this chapter without first having read that one! And you may have gotten the idea by now that all discipline starts with self-discipline by the parent. We aren't using the word to mean "punishment." In fact, "discipline" comes from the same root as "disciple," so we're actually asking how can we raise our children to become devoted followers of their highest ideals, not how can we browbeat them into obeying us. The very fact that discipline is an important issue for parents is symptomatic of our times. Many parents know more about what they don't want to do regarding the discipline of their children than what to do, or what the results of their approach will be. Because many parents today don't want to be authoritarian, they even question whether they should ever insist that their child do as they ask. Studies have shown that children do best when their parents are authoritative, charting a middle course between the extremes of being authoritarian or permissive. Authoritative parents effectively and consistently set limits for their children. Children naturally look to parents, as trusted adults, as knowing more about the world and how to behave in it than they do. Children are eager to become confident and competent and to make a contribution— to grow up. At the same time, they lack impulse control and have trouble deferring gratification, so it can be frustrating to them when they aren't able to do what they want or have everything they see. Fortunately, calling children "good" and "bad" when they do something we do or don't like has fallen out of favor, because feeling judged and labeled can have lifelong effects. I encourage you to go a step further and not even think of individual behaviors as "bad" and "good." Marshall Rosenberg, in developing an approach to living called Nonviolent Communication, or NVC, encourages us to see emotions and behaviors as arising when basic needs are either met or unmet. (1) As a simple example, when our need for harmony and cooperation is being met by seeing our boys playing together without fighting, we feel happiness and contentment. But, when their play devolves into hitting, feelings generated by our unmet needs for harmony and cooperation may make us less than effective at restoring domestic tranquility. Instead of being able to step in with a strategy that includes some imagination or a suggestion that will help one of them wait for the other to be done with a certain toy, we may act out of our annoyance, or we may even express annoyance that has been building up over several days. Then what we do (our unconscious "strategy") is most likely to result in a bigger scene. We've all been there when that happens. Although the basic principles of NVC are fairly simple, actually getting in touch with your own and your children's needs is not something that comes naturally to most people, because we weren't raised that way. My first reaction to this approach was "I don't have any needs"—but I had plenty of anger, which I eventually came to understand was a result of denying my needs. So this approach is important for helping you acknowledge that your feelings and needs are part of the equation. But what is going on with your children? Let's say your son, who is two, is resisting your efforts to put on his shoes and get out the door. Two fundamental principles of NVC can be very helpful here. One is to look for the unmet needs underlying the emotions, and the other is to have empathy for and acknowledge what the child is feeling. This doesn't have to be done on a verbal level, however, which would often lead to way too much talking about emotions with the young child. Similarly, trying to teach your young child to articulate his feelings and needs is way beyond his developmental level. However, cultivating empathy for a young child's perceptions and reactions is a valuable skill that we can learn as adults, though it can be challenging if adults didn't provide that for us when we were young. First, acknowledgment: what can you say that lets your child know that you get it, that he's being understood? "You'd really like to do this yourself!" Or maybe it's not about self-sufficiency, but he's feeling rushed or wants to go barefoot. Make your best guess and watch his response. At the same time, you can take note of any physical needs he might be experiencing: Did he wake up several times during the night? Have things been rushed this morning? Is he cutting his two-year molars? Often your acknowledgment of his actions and wishes will be enough to defuse the situation. Then follow up by repeating your request for "right action," which might sound something like this: "I understand that you don't like feeling rushed. Another day we'll have more time by getting up earlier. But this morning we need to see if your shoes make you able to run as quick as a bunny to the gate." It's important to follow up with your request, but a little imagination or distraction can go a long way. Sometimes it can help to a give a choice of two options that both still accomplish your aim: "Do you want to put on your shoes and hop to the car like a bunny, or put them on and fly like an eagle (in my arms)?" If you have a child who resists transitions, I suggest letting him know a few minutes in advance rather than setting up a pattern of negotiating after every request. If you and your two-year-old have fallen into some undesirable habits with one another, some of the suggestions in Harvey Karp's book The Happiest Toddler on the Block can be helpful. (2) Although I take exception to a few of his techniques and find his description of toddlers as "little cavemen" a bit limiting, in general I found his approach practical and useful. While it is appropriate to teach children where and how certain behaviors work—and where they don't—discipline means more than correcting undesirable behavior. It also means guiding the child to develop in a healthy way physically, emotionally, and mentally. We guide the baby largely by nurturing his physical body; we lead the toddler by ordering the rhythm of her day; and as the child becomes older, we take her by the hand and try to be an example ourselves. Once the child reaches school age, he is guided most by stories and the spoken word. (3) How to guide a child depends on his age, personality, and the nature of the parent-child relationship. Even within the same family, differences due to temperament and age mean that all children do not have to be treated in the same way—only fairly. It is impossible to speak about disciplining a baby in the sense of correcting her or making her do something, because the baby's will is both very strong and not under her conscious control. A baby doesn't do things either because of us or to spite us, and she can't change her behavior because we want her to, even if we insist upon it. This can either strengthen our patience and develop our nurturing capacities as new parents, or it can result in extreme frustration. We read from time to time about tragic cases of injury or death from shaken baby syndrome, when parents are isolated and fail to get the help they need with their own anger or frustration. Taking care of an infant is not easy, and newborns cry an average of one to four hours a day. Anyone can experience transient anger toward a crying baby, but if the impulse to shake or hit is strong and recurrent, please find local help or start by calling an agency such as the National Child Abuse Hotline (800-422-4453). Instead of getting angry or trying to reason with a young child, who doesn't have the memory or consciousness for reasoning, keep in mind the principles of example and imitation that are so effective with the child under the age of eight. If you want to teach a certain behavior to your child, one of the best ways is to actually perform that behavior in front of (or with) him. This demands that we get up and actually do something rather than giving the child orders or directions. For example, instead of saying, "Don't eat with your fingers," pick up your spoon and very purposefully go through the motions yourself while stating the positive, "We eat with our spoon." Or instead of saying, "Go clean up your toys," we need to go with the child and do it together, while saying, perhaps, "It's time to put your toys away." Movement combined with the smallest amount of fantasy, song, or good humor can go a long way toward getting the child involved in an activity. For example, when you are cleaning up with your child, you can ask the truck driver to steer the truck to its garage or get the cowboy to ride the stick horse over to the stable. Another strategy is to join in the children's fantasy rather than interrupt it. So, if the children are involved in play, ask the train drivers to move the train out of the walkway while you start moving the chairs with them instead of interrupting their fantasy by telling them to move out of the way. What about things you've told your child a hundred times? For example, you've told your five-year-old "Don't slam the screen door!" at least that many times, but to no avail. Try gathering your intention, meeting him at the door, and saying with good will, "We close the door quietly," while you move his hand through the motion of gently closing the screen door. That will probably do it. If not, a second time is probably all that is necessary. Movement and stating what it is you want to have happen, rather than what you don't, communicate with children in a way they can understand. Whenever possible, state the positive. Say, "Pet the kitty gently," while you demonstrate how to do it rather than shrieking, "Don't hurt the kitty!" Sentences with "don't" will communicate your displeasure, but the brain often doesn't process every word, so the message may in fact register as, ". . . hurt . . . kitty!" It's a lot more effective to say, . . . gentle . . . kitty," instead. This approach—always trying to say things positively—takes practice and awareness. But the power of "yes, and" is astonishing. For example, if your three-year-old wants to ride the bicycles to preschool and you need to take the car that day, you could say, "Yes, that would be fun' And today I need to take the car to go shopping afterward. We'll ride the bicycles again another day." We think that "another day" wouldn't be satisfying to an older child or an adult, but it's magical how affirming young children find it. It isn't until elementary-school age that a child is ready to respond consistently to words that are not accompanied by your actions. With the preschool-age child, you need to correct and demonstrate the right behavior again and again, but you can't expect children to remember it. Their memories simply aren't that mature yet. There will be slow improvement over time, but the "learning" that does occur takes place through gradual maturation and through forming habit patterns. For example, early in the year at Rainbow Bridge, several children couldn't sit calmly during snack time. "We sit with our feet in front of us," we repeated again and again as we reseated the child or showed our own straight way of sitting. After several months the children were able to sit calmly during snack time, both because they were older and because the lesson had been repeated so many times that it had begun to penetrate the body. Gradually the child who couldn't stay in his chair could calmly eat and wait for "Red Bird" to come and choose who would blow out the candle, signifying it was time to go and play. But it took a month or two of constant repetition with a group of new children. Only around the age of five does the child have enough memory and perspective on the world to begin to remember what he should and should not do. I saw this stage with a little boy in the preschool who was corrected nearly every day for rough behavior toward the other children. We tried everything! As he approached five he started to remember after he hit someone that he wasn't supposed to do that, and he began to feel regret for both the action and the situation that would follow. But it took even more maturity for him to be able to start remembering before he struck out; because of his fiery temperament, it was more difficult for him to get control of his emotions than for many children. It was a real effort and a test of patience to work with him and to constantly insist on the right behavior, which he was eventually able to master. In my experience, even in these instances it isn't necessary to start out with a head-on confrontation and battle of the wills. In the first case, you simply help the child put his coat on; in the second, you could suggest what he can do (either play quietly inside or go outside and play); and in the third case you give him a piece of paper and try to guide his activity into more appropriate channels. Where I would use a sharp "no!" is if the child were about to run out in the street or were about to bite another child. In these cases I might even clap my hands or I would jump up to intervene. If you seldom use "no," then it can be used rarely to startle and get a child's attention so she realizes that behavior is not to be repeated. Short of that, deciding when something will be harmful to a child requires judgment, and the more you can fine-tune your judgment, the better for your child. If we can support our children in having their own experiences without excessively saying "no" and without interrupting them, they will learn a great deal about the world and about their own abilities. Climbing trees is an example. Yes, there is a certain amount of danger, but if I hadn't let my youngest daughter climb trees I never would have known that she really should have been born into a circus family that performs high-wire acts. As a child, she would climb up twenty feet and sit and play her wooden recorder, and now she is studying aerial dance! Once when she was four she got stuck up in a tree while my husband was away, so I had to get a neighbor to climb up our forty-foot ladder to help her (not for me, thanks!). The neighbors were hysterical and kept calling up to her, "Don't be afraid!" I had to explain that she wasn't afraid, just stuck! It is important that before you say "no" to a child that you are sure what the child intends and certain of your response to that action. Sometimes it is good to pause for a moment and decide what to do first, because if you frequently change your mind, you can confuse him and encourage a habit of pleading until you give in. Being simple and consistent is important so that your child knows that you mean what you say, and that your word is followed immediately by action. Many parents ignore their child's negative behavior until they either give in or lose their temper. We probably all know that pressure cooker feeling, when the steam is building up—unexpressed and sometimes unacknowledged—until we react out of all proportion to the irritation at hand. Other parents always keep their cool, but the child never feels acknowledged. For example, a woman with a baby and a two-year-old in one shopping cart and groceries in the other was ignoring the crazy behavior of her two-year-old, who became more and more annoying as he tried to get a reaction. By the time we were both at the checkout stand, he was having a full-blown fit. Although she was still able to ignore it calmly, we need to recognize that it is frustrating to children to be allowed to get crazier and crazier as they keep trying to get a response. There are a lot of calm but effective things she could have done along the way, like stopping the cart and saying it doesn't move unless he's sitting down; singing to him; engaging him by saying she'd let him get the pineapple juice, putting five things in the cart on the way to the pineapple juice, then letting him stand up and pick it off the shelf; or asking him to watch in the produce section and tell her when he saw the carrots. Children don't have to be crazy or drive us crazy, but they do require— and deserve—creative interaction. Young children can often be helped by modeling what it is they could say ("Let's ask him if you can have the truck when he's finished"), acknowledging that it's hard to wait, and then looking for something else to do in the meantime. Sometimes, however, a child who continues to raise a fuss needs to be removed from the action until he is ready to do what is needed (use gentle hands, wait for a toy, or whatever is at issue). Usually a couple of minutes is all it takes for a child to get himself back together and be ready to try again. This is not punishment or "time out to think about what you have done," but instant feedback that certain behavior is required in social situations. Remember that you need to move with the young child, not give orders. So out you go, away from the action, along with the young child and state that just as soon as he is ready to return, he can go back. Then you stand there absolutely stone-faced, so it's really boring to be in another room with such a parent while everyone else is having a good time. If this is not enough, offering a snuggle or getting him interested in something once you go back in can also help him reintegrate into social activity. With negative behavior such as hitting, it is still best to emphasize the positive actions. 'We need to be gentle with our friends." "We need to take turns." If possible, put your energy into the child who has been wronged rather than putting your attention on the offender. Obviously, spanking or hitting the child is providing a model of the thing you are trying to get him to stop doing. It sends a really mixed message, because our actions speak to a young child much more powerfully than our words. Biting is one of the behaviors that deserves a sharp "no!" Just as the nursing mother needs to get the baby's attention and remove her from the breast when she bites, your displeasure is appropriate in response to this behavior with other children. Some children bite when they're struggling for a toy, while others will walk up and bite their parent or another child seemingly out of the blue. Others will bite whenever they get too close to another child (hence hugging other children is discouraged with these children!). Until this phase has passed, it is necessary to be extremely vigilant with a child who bites, and it can be reason enough to stop preschool for a few weeks to see whether the behavior improves with a break. Because children are so imitative, we need to monitor our own emotions and actions when interacting with them, for our actions and emotions speak louder than our words. How can we keep our own tempers at those times when we feel like throttling our children or yelling uncontrollably? One of the keys to discipline involves bringing one's own consciousness and objectivity to the incident—talking in a quiet voice, sticking by what you say, repeating it if necessary, and, whenever possible, actually moving with the young child. Developing some success with this approach can help defuse your own frustration and make it easier to come up with "adult" and creative approaches to your child's annoying behaviors. But no one can do this all the time. When you are in a situation that has gone south, give yourself time to get into a better place and then reflect on what happened. What was going on for you? What were your triggers? What do you tell yourself that justifies your blow-up? (You might think, "He should be able to. "If I don't correct him now " or "No one respects what I say.") Try to imagine other responses and determine what you would need to do earlier to be able to use them. Children don't do things just to annoy you. They're exploring the world and trying to figure out what works and how to get their needs met. Unpleasant situations with your child occur only in areas in which you have unconscious or ambivalent feelings. Otherwise, you'd be able to respond to the child in a way that wouldn't contribute to a downward spiral. This is one of the reasons why children behave so differently with their parents than with their preschool teacher or someone else who is clear about what works and what doesn't. It can be useful to consider what your child might be gaining in a situation in which it looks like both of you are losing. For example, if your child is whining, she must be getting what she wants from it some of the time, even if it's just more interaction with you or a negotiated settlement. Remembering that loving your child is more important than "straightening him out" may help you call a halt when your child's behavior and your own are both spiraling out of control. Too many parents remain silent until they overreact from a string of annoyances that have been smoldering. As a result, the child often feels underacknowledged and thus makes life miserable to get attention, while the parent is feeling overwhelmed much of the time. If this is happening to you, it's probably because you are denying your own needs and could use some help setting effective boundaries sooner. In this case, find a friend you can talk to, talk to a family counselor who can provide a more objective perspective, or attend parenting classes. Even an online class with individualized counseling can help (I recommend Joyful Days with Toddlers and Preschoolers with Faith Collins, listed at the end of this chapter). Somehow you need to acquire new knowledge and new perspectives, as well as ways of defusing your own emotions. This is especially true if you were abused emotionally or physically as a child, but it can be true for anyone. Your child is providing you with the opportunity to fix what is broken— before it becomes broken in him or her as well. Living with young children is both demanding and rewarding. It requires attention to create a harmonious life, and there is often very little time for other activities (this is where extended family or support systems are a must). Children are young only once. They will soon be away at school and there will be much more time for your own activities. Understanding the nature of the young child can help you raise a happy and well-behaved child, as well as a bright one, and can help you have fun and find satisfaction in the process while you continue in your own growth. It takes a tremendous amount of energy to nurture a baby or young child. Even preschool and kindergarten teachers find that they must get enough sleep to replenish the kind of energy that young children seem to demand. Your best intentions will come to nothing when you are excessively tired or irritable. The first thing that is necessary for a happy and healthy baby or toddler is to have a happy and healthy mother. This means you must be sure you are eating well and taking vitamin supplements for at least as long as you are breastfeeding. Interrupted sleep, especially in the first few months after birth, can compound fatigue and complicate the adjustment to new parenting. Babies are nourished by your love and care just as they are nourished by food. The reason that parenting young children takes so much energy is that the life forces of the mother and baby are interconnected throughout the first three years. Young children are surrounded by and consume what Steiner calls "etheric" or "life energy" (we might call it "vitality' or "life force") from their parents, caregivers, and teachers. Mothering is deceptive, because sometimes it seems as if you're accomplishing so little, so why should you be so tired? However, caring for young children draws on your vital energy, and you need to replenish your own vital forces in order to continue to feel good in your mothering. Three things that can really help replenish this energy are sleep, artistic activity, and meditation. Try to make sure that you get enough sleep by scheduling a nap when your baby or toddler naps. Maintain a quiet time for your child every afternoon when he or she stops napping as much for yourself as for the child. As a preschool teacher, I always found being in bed by ten an essential part of my preparation. Otherwise, I couldn't stand the noise and couldn't keep my emotions on an even keel. Artistic activity involves the same vital or creative forces that your infant or toddler is using, but it replenishes rather than depletes them. Playing a musical instrument, drawing, sculpting, or painting can all help mothers have more energy. Writing down your thoughts, experiences, and insights can also be helpful. The regularity of doing something like taking a walk each day can likewise be of great help in keeping your balance and replenishing your energy. Contact with nature can help us feel refreshed as well. Meditation can be as simple as setting aside five minutes before you go to bed to center yourself in your breathing or concentrate on a single thought. Returning to your own center through meditation or prayer not only helps replenish your energy but can also help you maintain equanimity in the midst of all the stresses of parenting. A number of years ago I discovered that I had been involved in the caring professions all my life without having much relationship to the feminine aspect of the divine. This led me to explore becoming grounded in my body and on the earth through dance and deep tissue work, and to investigate how I could feel supported and nourished by the feminine. The books listed at the end of chapter 1 were especially helpful to me on the journey. Out of working with The Woman Awake: Feminine Wisdom for Spiritual Life, by Regina Sara Ryan, for example, I developed a practice of starting the day at Rainbow Bridge by visualizing myself sitting on the lap of the Great Mother and dissolving backward into the heart of love. (7) Needless to say, it was and still is transforming, as is a mantra a friend suggested to me, 'What shall I do with this opportunity for love?" In addition to setting aside time for meditation, set aside time to spend alone. Even an hour or two spent out of the house can help you in your mothering. Most women in nuclear families live isolated from other adults, so try to develop the social network you need. Some fathers are primary caregivers while the mother continues to work; in that case, the above advice applies to them as well. When the father is working outside the home full time while the mother is at home, he can still play a vital role in helping the mother maintain her vitality. With a child under the age of three, this involves actively supporting her mothering emotionally and financially so that she is encouraged and strengthened in being with the children. I hate to risk sounding traditional by speaking of men as "providers and protectors," but there is some validity to that image when both partners apply it with consciousness. However, this does not excuse men from the need to develop their own nurturing side so they can assume co-responsibility for the children rather than depending on the mother to rise to every parenting occasion. Single parenting, with or without a husband in the home, is not an easy task! Part of what makes the first six weeks of caring for a new baby so hard is that the baby seems to have no pattern to its eating and sleeping—at least nothing you can depend on. Rhythm gradually does emerge from chaos, and life becomes easier over time as rhythm becomes established and builds a framework that can support you in your other activities. This lack of framework can be very disorienting in the postpartum period, comparable to when a person retires or a career woman quits work when pregnant and finds she can barely get out of bed in the morning because life has become so unstructured. "Experts" in the 1950s told mothers to give babies a bottle every four hours (and not a half hour sooner!) no matter how loudly the baby protested. In reaction to this sacrifice of the individual to the clock or the book, the pendulum swung the other way in the 1970s, with most breastfeeding mothers nursing their babies whenever they were hungry or fussy. Demand feeding takes as its model non-technological cultures in which the baby is carried in a sling next to the mother's body and can nurse any time she wants, which usually involves nursing frequently for short periods. Many mothers who take their babies to bed with them find this same pattern of frequent nursing continuing throughout the night as well, throughout the first year or longer. Most people today agree that a young baby's needs should be met as they arise, and mothers are more likely to trust their instinct to respond to their babies with love and the breast. But when does this change? At six weeks, six months, two years, or later? I would like to propose an alternative to the polar opposites of feeding on demand versus feeding according to a schedule, and that is gradually working toward establishing rhythm, which will change as the baby grows. One of the tasks of the growing child and one of the functions of parenting is to bring the child into rhythm. Consider how arrhythmical a newborn's breathing is. Sometimes she takes short gasps, while at other times she holds her breath—it's quite startling if you really listen to your newborn breathe. Babies' heart rates are also much faster than adults'. As the child matures, the breathing and the heart rate gradually become coordinated, and then around age nine they assume the adult ratio of one breath for each four beats of the heart. Working toward rhythm does not mean slavishly going by the clock or letting your baby "cry it out." It does mean being aware of rhythms as they emerge and change, honoring and encouraging them. Working toward rhythm is especially valuable in dealing with naps and sleep and avoiding sleep problems. At first your baby requires sustenance during the night; it's a physiological fact. But after the baby's stomach and digestive system can get enough nourishment to last for an extended period, waking and feeding are for other purposes: simply from habit, to be comforted by your presence, or to play. You need to decide your style of mothering and what is right for you and your family. As long as you are happy nursing your baby at night, there is no need to change. But when you grow tired of being awakened at night—and your older baby could be sleeping longer—it is possible to change his habit pattern. First, you need to gather your intention to stop nursing the baby when he awakes at night. Then, when he cries, you can go in and say, "I love you, but this is time to sleep." You might hold and rock him, or just pat his back and then go out. It isn't easy to hear him cry, but stay connected and go back in after three minutes and pat him again, saying, "I'm sorry you're so upset, but it is time to sleep," keeping your voice and actions very drowsy. You then go out for a longer time and repeat as necessary. The child soon learns that food will not be forthcoming, but he also doesn't feel abandoned because of your love and concern. Without the possibility of food or play, he will soon start sleeping longer without waking up. My own experience is that it generally takes three days or nights to change a pattern, but it can also take a week or longer. There are so many schools of thought on what babies need and how to parent. I encourage you to trust your own heart and to be as aware as possible of your baby's needs and of what you are really feeling. If you're content nursing your baby all night, then that is working for you. But if you feel as though you'd appreciate uninterrupted sleep at night and are starting to resent the cry in the night or the constant nuzzling against your body, you should realize that it's all right and easy to change your child's patterns if it's done with love and awareness. Bringing the child into rhythm when the time is right is part of life in all cultures. Only you can decide when that time is for your baby, for you, and for your family. Doctors and even formula companies now admit that breastfeeding is the best start you can possibly give your baby. It's something you should continue as long as it feels good to both mother and baby, but any amount of nursing is better than no nursing at all. If you are considering weaning in the first month, chances are that you are having difficulties; it should be pleasurable for both you and your baby. Working with a lactation consultant can give you the help you need. Often doctors give the wrong advice, which is less likely to happen with women who are knowledgeable and trained to help nursing mothers. If you encounter special situations, such as going back to work or illness, La Leche League or lactation consultants can also provide the support you need to successfully breastfeed in these circumstances. As you have probably figured out, I am not into authorities telling women what to do with their bodies. When women listened to doctors, they didn't breastfeed at all, which was clearly bad advice. Then American doctors recommended breastfeeding for six months, and now the American Academy of Pediatrics has extended the time to twelve months. The information and impulses from our formula-pushing culture need to be balanced by the information on natural mothering and extended breastfeeding provided by organizations such as La Leche League. However, I feel their emphasis on "child-led weanin' needs to be balanced by information that it really needs to be "nursing-couple-led weaning' both your needs and emotions and the baby's count. It really is all right to stop offering your baby or toddler the breast when it comes to that time. Weaning, like death, is part of the shadow side of life. It involves the ending of one phase and moving on to another. Try to become aware of your own needs, comforts, fears, and questions that might either lead to early weaning or work against weaning when your child is able to move on to a more independent phase. You may have feelings such as "Breastfeeding is so pleasurable, why would I ever want to stop?" or "It's so wonderful to be touched and needed like this—do I really want my child to become more independent?" or "How will I show my love for my toddler in the next phase?" Being aware of your own emotional undercurrents can help you be more aware of your baby's real needs and more alert to the subtle cues that he or she is giving you. You may even find that there are spiritual realities that make weaning at nine or twelve months a natural event. For example, some people working from Steiner's indications have observed that when the child achieves uprightness and walks (between nine and twelve months), he is freeing himself and asserting his individuality; they have felt that achieving similar freedom in the area of nutrition is appropriate at this time as well. Certainly the baby is able to eat and even reach for table foods at this age. One of the tasks of the first seven years is for the child to assert his individuality by overcoming or remolding the forces of heredity; because these forces are particularly strong in breast milk, prolonged nursing of toddlers is viewed with alarm by many working out of Steiner's view of human development. (9) American readers may be surprised, amused, or annoyed by the rigidity of some of the books by medical doctors working out of Steiner's indications who prescribe weaning at the "traditional time of forty weeks" (nine months). Since mothers were advised to wean by six months in some of the older versions of these same books written by European pediatricians, one has to try to distinguish between cultural influences and spiritual "facts." However, it can be valuable to ask ourselves whether there is an observable truth behind what anthroposophical (Steiner-based) writers are noticing about the toddler's changing consciousness and needs in today's world. In her book Mothering with Soul, Joan Salter described how many women connected with the Gabriel Baby Centre in Australia felt that weaning at nine months was too early, so they were starting to wean around nine months and finishing by twelve. (10) The fact that Salter felt it necessary to justify this by using esoteric numerology to show how the nine is transformed into the twelve left me somewhat bemused, however. Once the baby is able to eat table foods (around nine months), the nature of breastfeeding changes to fulfilling a need that is more emotional than nutritive. La Leche League speaks of baby-led weaning, pointing out that some babies really do wean themselves and others don't, continuing nursing until they are three or four years old. The League and The Continuum Concept by Jean Liedloff point out how common it is in less technologically developed cultures for children to be nursed for two or three years or longer. Do these cultures provide a model of "natural mothering' that is valuable for us to copy? The development of individual consciousness, which is so advanced in the West, presents a fundamental dilemma. On the one hand, our extreme individuality has caused alienation, anxiety, competition, and the denial of the spirit. On the other, we can't escape it just because we can read about other cultures, whose group consciousness may not necessarily be appropriate for us in the world in which we live. However, something new is clearly needed or we're going to destroy ourselves. Steiner's answer is that our individuality is appropriate, but we must now go on to the next stage and find a reintegration of spirit and matter from our modern vantage point. To do this, we have to start where we are. Although some mothers are content to take their cues from other cultures in nursing their toddler or even older child, I have encountered many mothers who are "suffering through" nursing an older child, anxiously waiting for their child to wean herself. I've even had mothers with nursing four-year-olds come to me for advice on weaning, terrified of the scenes and "trauma to the child" that they were sure weaning would produce. I worked with several mothers at the Birth Center who didn't want to stop nursing their toddler during pregnancy but found that once the new baby was born, they felt completely exhausted and overwhelmed. Yet still they didn't feel free to wean the older child. My feeling is that perhaps, in these cases, we should take our lesson from the cats, bears, and most other mammals who are more into self-preservation and preservation of the young than that. There is no way I can believe that an older child's sucking need is being well served by a resentful or exhausted mother. Babies and older siblings register and take in emotions just as deeply as actions. Breastfeeding is like making love—nothing is gained in suffering through it. Regardless of how long you breastfeed (or bottle-feed) your baby, the question remains about when to start introducing solid foods. In our culture, pediatricians used to want mothers to introduce solid foods at three months (or earlier), either because a baby was not growing enough or (in my case) because he was too fat! The trend now is toward waiting until six months, but some pediatricians may suggest solids earlier. La Leche League has good advice about how and when to introduce foods, and if there is a history of allergy in your family, giving nothing but breast milk for the first year can help prevent sensitization to food and other allergies. There is no need to supplement iron for breastfed babies; they don't become anemic in the first year from a breast milk diet. Steiner gave many indications about nutrition that vary quite a bit from information commonly available today. Interested readers can refer to When a Child Is Born by Wilhelm zur Linden (11) or A Guide to Child Health by Michaela Glöckler and Wolfgang Goebel. (12) One interesting thing I have gleaned is that what children eat before the age of three is what they acquire a taste for, and I have seen evidence of this many times. For example, we gave our youngest daughter almost no red meat before the age of three, following Steiner's indications that red meat is very dense and inappropriate for young children. Even though we aren't vegetarians, as a teenager she wouldn't eat most meat and preferred tofu. A friend brought up her child without any sugar or sweets before allowing occasional sweets when the child entered preschool. It was interesting to observe that the girl really had little taste for the cupcakes and other treats at birthday parties. This seemed to go beyond a desire to fulfill her mother's wish that she partake moderately of these foods. Since babies can't verbalize their feelings and needs, they cry for a wide variety of reasons. We are taught to see whether they are wet or hungry, but if they are not, we usually try to hush them up or ignore them. As we have seen, it is important to respond to a crying baby, not leave her to "cry it out." Having a "colicky?' or high-needs infant can be a real strain on parents. There are many techniques you can try—looking for food allergies, burping the baby frequently, putting warmth or pressure on the tummy, giving weak chamomile tea—but there doesn't seem to be any statistical correlation between causes and cures for colic. Limiting stimulation and trying to create a calm environment should certainly be the place to start. Above all, try to remain calm yourself, because it is impossible to calm a baby if you are tense and annoyed (remember how imitative they are on the physical level!). Also remember that you are not responsible for your child's personality or temperament. Sometimes the best you can do is just be there for the infant, lovingly holding her while she cries. Crying can be a great release if done in the arms of someone who loves you. In the evening, after we put Tara to bed, she sometimes wakes up after about an hour or so. At this point, she starts to cry, and we do not respond immediately, because we want her to learn to go back to sleep. . . . The decision whether to get up or not is a function of the nature of the crying. There's a kind of crying that is whimpering, where it's clear she is still asleep, and a kind of cry that is screeching, and it's obvious she is awake and distressed. However, there are some in-between cries, where it's hard to tell how she's feeling. Some parents sleep with their baby in bed and respond to their baby's waking up by giving the breast while barely even waking up themselves. Others find that there comes a time when they want more space at night and then must get up to respond to their older baby or toddler. Once again, there are no simple formulas to determine the right or wrong way to parent your child. You need to feel your own way through the easy and difficult times. The Milwaukee LifeWays Center is an example of these principles being applied in an American context, and Rainbow Bridge LifeWays Program, which my daughter, Faith Baldwin Collins, and I established in Boulder is an example of such an in-home program. Photo essays on both can be found at www.lifewaysnorthamerica.org. The ideal would be to have such mixed-age, relationship-based programs available in every community, but the reality is that most nonmaternal care for infants is substandard. (18) Although it is clearly out of step with the times to say the following (like asking for books on birth in the feminist bookstore in the early 1970s), I nevertheless have to take the risk and suggest that if you can possibly stay home with your baby for the first year, you should do so. However, having spent four years doing mixed-age child care with one- to five-year-olds using the LifeWays approach, I have to say that I have found that children today seem to be much more eager to be with their peers than children were twenty years ago—and vastly more than my generation was! Among contemporary early childhood experts, only T. Berry Brazelton, called America's favorite pediatrician, has swallowed hard enough to write a book about putting your child in day care. In his popular book Working and Caring, (19) he discusses what mothers need to consider in looking for child care for a baby or a young child, the emotions involved in going back to work, the concern about the primary caregiver replacing you in the child's affections, the increased number of illnesses and need for antibiotics, and so forth. The reason parental care is so important is that it establishes a secure parent-child relationship and creates a calm and rhythmical life for the infant. No caregiver can match the enthusiasm and excitement of parents over a baby's accomplishments such as sitting up and walking. Such reactions reinforce the parents' commitment and love and contribute to the child's developing sense of self-worth and security. In addition, the parents are best able to be there to satisfy a toddler's curiosity about all the things she discovers. Although studies have shown that ideal substitute care situations do no measurable harm to children, all situations are not ideal, and no studies show substitute care as being better than any but the most abusive family. Steiner explains the uniqueness of the mother-child relationship, which contemporary educators have also documented in the first three years. Steiner observed that the etheric or vital energy of the baby is connected with and protected by the mother's vital energy, which surrounds it like a sheath, just as the baby's physical body was protected before birth by the physical body of the mother. Just as the child's physical body is freed at birth, so the child's etheric body is gradually "born" over the first seven years, with an important freeing from the mother occurring around the age of three. This change is quite dramatic if you are alert for it; suddenly your child is much more independent, much more able to be away from you comfortably, and more able to participate in group activities. This is why Waldorf preschool programs have traditionally preferred to accept children around age three and a half, after they have gone through this freeing from the mother. According to Steiner, the baby in the first year is still totally connected to the mother's vital (etheric) energy and nurtured by it. This seems to explain the psychic connection or heightened awareness that exists between mothers and their babies. 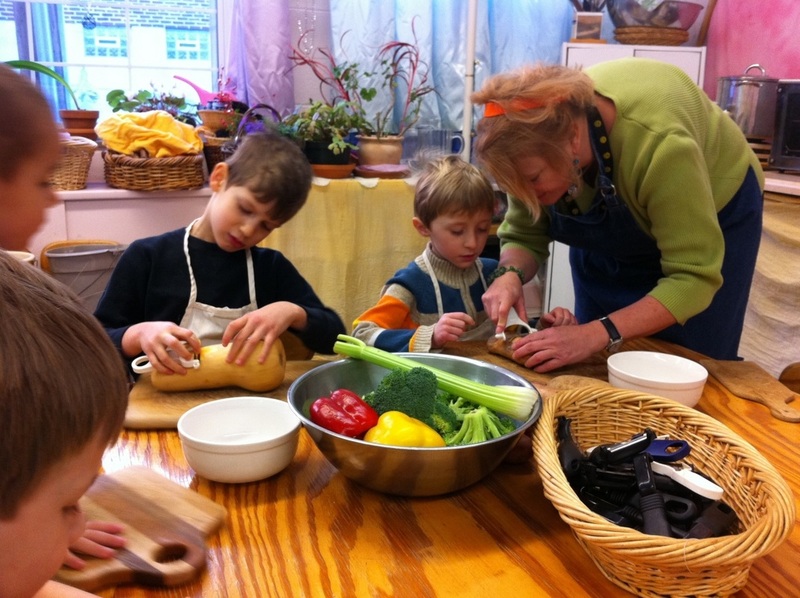 When I was a Waldorf preschool teacher in the 1980s in Ann Arbor, Michigan, most mothers stayed home with their children or only worked part time. I observed that the children who had been in child care since the age of six weeks stood out quite noticeably: they tended to be sick more often and more used to antibiotics because their parents couldn't stay home for recuperation time; and they seemed less childlike, having dealt with the stress of other adults and groups for many years. David Elkind, in his books The Hurried Child and Miseducation, speaks of the high level of anxiety with which our children live, and how we push them to grow up and cope with things that should be beyond their years. If there is any way you can stay at home at least during the first year, it is of tremendous value to your baby and can be rewarding for you as well. Your baby only begins life once and will grow up so quickly! But there is not a lot of support for mothers who want to stay home. Maternity leaves are usually too short, careers don't wait for many women who decide to have children in their late thirties, and today's lifestyles often demand two incomes. But if it is your heart's desire, work something out and find the support you need. The Mothering online community (www.mothering.com) is a real support for women who value what they do with their children. Many websites for working mothers can also be very helpful. Or perhaps you can arrange to job share, work from home, or work part time? Obviously, finding quality child care is one of the major dilemmas facing parents today. If you need to find a home or a facility for your child, take the time to visit and thoroughly check out several of them. How your child is cared for all day does matter. As a first-time mother I had no notion about protecting my baby's senses and took him with me to Kmart at ten days of age. Although I knew how zingy the fluorescent lights of big-box stores make me, it didn't occur to me that my baby was even more sensitive to the environment. 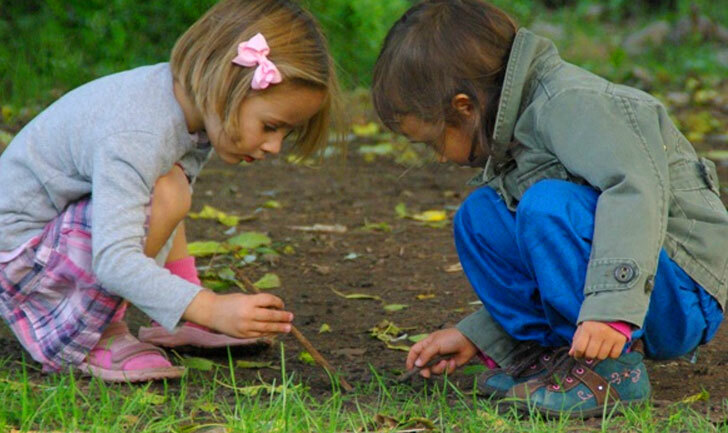 What I learned about child development through the work of Rudolf Steiner and others was that during the years from birth through age six, every aspect of the environment has a more profound effect on the growing child than it will when he is older. Obviously you're not going to be taking the same care to put silks over the bed with a ten-month-old that you might with a one-week-old! The toddler is much more "here" and is quickly adapting to earthly life. Preschool- and kindergarten-aged children can become desensitized to their environment, but it is still beneficial to maintain an awareness of the quality of their sensory experiences. For example, taking a child under the age of seven to the movies or to "baby dance parties" or rock concerts provides more stimulation than a young child can process. Even in the home, the sensory experience provided by any kind of screen time (DVDs, television, computer games, or an iPad) has been shown by neuropsychologists and ophthalmologists not to be good for the developing eye and brain of the young child, regardless of the content (this is discussed in greater detail in chapter 12). when the child is older. It is especially important to continue to keep your child warmly dressed (but not overheated!) throughout early childhood, protecting the vital organs in the trunk with an undershirt or T-shirt and keeping little girls' legs warm when they are wearing dresses. It is also beneficial for children from infancy to age seven and older to wear hats whenever they're out in the sun—a habit we'd do well to imitate! In response to the swing of the pendulum described above, a more recent movement toward "diaper-free toddlers" has arisen, partly in reaction to the cost and strain on landfills of disposable diapers. There is even a movement for diaper-free babies, called "elimination communication," based upon developing sensitivity to the baby by carrying him or her all the time, as in rural India, for example. Although in our culture it is difficult to be so tuned in to your infant that you can catch every impulse for eliminating before it happens, it isn't difficult to observe when a toddler is interested in and physiologically ready for the process. The "diaper-free toddled' folks recommend dedicating a three-day period to toilet training that involves giving away all the diapers, letting the child go bare-bottomed or dressing him only in loose-fitting pants (with no underwear) that he can pull up and down himself, and reinforcing every success using little potties that are readily accessible. Dr. Sears has published a book on the three-day method, and over a thousand families in the San Francisco Bay Area have attended preschool teacher Julie Fellom's training called Diaper-Free Toddlers. Although some children make the transition more easily than others, it seems to work! You can learn more by searching online. Second children usually toilet train themselves much more easily than first children because they have a sibling to imitate, and because parents are much more confident about it. Remembering how imitative children are, let toddlers see how it's done, and provide a little potty around the age of two. Many children feel insecure sitting on the big toilet, so a potty chair can be very helpful. Making it a special present and praising children each time they use it will reinforce their new behavior. After a three-day marathon, there will still be occasional accidents, but patience and a cheerful, "Too bad, maybe next time you can run faster," will soon lead to effective results. There has been a lot written in recent years on mother-child attachment, or bonding, and what can happen when this breaks down through prolonged separation, as in the case of premature or ill newborns. However, we also need to realize that under normal circumstances the mother and child are also going through a separation process. They start out as one, contained within one body, united both physically and psychically. Instead of trying to create a bond at birth, the question arises, "How can the separation of birth not be so painful or prolonged that the mother disconnects from the child?" The obvious answer is through humane birth practices that encourage the mother and child to remain together. Increased contact helps bridge the separation and establish a new relationship rather than leaving the mother feeling let down and isolated by the passing of the old one. This separation process of mother and child goes on throughout life as the individuality of the child asserts itself more and more. The mother must constantly let go of her image of the child and their relationship as it has been so the child can more fully be himself and a new relationship can be born. We have talked about the nine-month-old's common anxiety about people outside the family, and the child's pattern of going away from and coming back to the matrix or source of security. However, separation is also painful for the mother, as anyone who has left her baby for the first time knows. The full breasts, the psychic connection, the concern about how the baby is taking it, and the worry that no one can possibly care for this child as well as she does all pull at a mother's heart strings. The same is true the first time the child goes to school, has her first date, or drives the car alone. We want to protect our children, but we need to realize that they are not extensions of ourselves. Your child is in fact a unique individual who has chosen you to be his or her parents. The individuation process needs to be allowed to occur in order for the child to grow up in a healthy way. In fact, a failure of individuation can cause as great a problem as neglect. We need to recognize a child as a unique individual from the beginning and do everything we can to avoid hindering her in realizing her full potential and destiny in life. How does this translate into action? For one thing, it means being watchful but not overly protective. (What if the mother of Sir Edmund Hillary, who first successfully climbed Mount Everest, hadn't let him climb the stairs as a toddler?) Perhaps it means letting it be all right for your child to climb a tree or climb to the top of the swing set at the park. Chances are your child will do fine if she undertakes it at all; children are fairly self-regulating if you don't help them into places they can't get to on their own. Another way of putting this is, ''How can we be as relaxed about our first child as we would be about our fourth?" Naturally, we can't be, because everything is so new. But the "benign neglect" and the interaction with siblings that a younger child receives are beneficial compared to the hovering "helicopter parenting' and the constant push into adult activity that first and only children tend to receive. As parents, we need always to keep our toddlers in our psychic awareness, but we don't always need to be interacting with them. Raising a child who can play alone, who is self-motivating, and who does not always need adult input is a real blessing. We need to hold our children in our love and awareness, provide a rich and safe environment for them to explore by themselves, and be there when they come back to touch base. This may happen every few minutes at first, or every few hours as they become older—or just at family meals as teenagers. Raising a child is a full-time task. Someone has to be attending to your child all the time. You as parents have a unique relationship with this person and should value both the time and the effort necessary to take care of a toddler. But the same person doesn't have to do it all the time: you can trade off, engage grandma, have a babysitter, nanny, or mother's helper, or work out trades with a friend who also has a young child. The at-home parent should do whatever is needed to maintain his or her own composure and ability to mother or father this young child. At the same time, don't undervalue your parenting or accept the comfortable illusion that "quality time" makes up for the constant demands of the toddler to be in relationship with you as he or she goes out to explore the world. If you must return to work full time, try to choose an environment for your child that is as much like a home as possible. Some women—even those who have dreamed of being able to stay home with their children—are blindsided by the lack of value placed on mothering and the isolation and frustration created by our lack of extended family and lack of neighborhoods. Fathers who stay at home with their infant or young child while their wife works outside the home face additional challenges, such as being the only father at a parent-child class or not knowing any other men who are in a similar role. 1. Is your child especially clingy? Could you simplify and change the environment to make more interesting things accessible to your child, encouraging his exploration of the world? Can you change your expectations of your child, relaxing and recognizing that "this too shall pass"? Decide to spend three days devoted to nothing but "being there" for your child and observing, without resentment and without trying to get twenty-five other things done. Perhaps your child will start to branch out as he feels the solid base of your uninterrupted support. As your child approaches three, having more children around is often easier than having only one. Can you trade days of child care with a friend, thus making your time with the children more intentional and giving you time away? 2. Do you find yourself engaged in constant conflict with your child? List the times of day and the activities that lead to conflict. What could you do to change each situation (lay out clothes the night before, get up fifteen minutes earlier, have more ritual and rhythm at bedtime, change your reactions)? What attitudes and expectations do you have? If you are a single parent, can you enlist someone else to observe the two of you and give you some much-needed perspective? If you have a partner, what does he perceive about what is going on? What does he feel about it? Is he supporting you and correcting the child or ignoring the situation? Do you get louder to try to get a reaction from him? 3 Do you miss intellectual stimulation or adult companionship? Can you find a mother's support group or join a playgroup? Can you go to the park once a week with a friend who also has a toddler? Satisfied mothers of young children seem to be much more social than single women. They are often going to visit a friend with children or having them over. Sitting in the park or visiting are not luxuries we have at every stage of life. Can you come to appreciate these activities? Do you have a good relationship with your husband? Do you have evenings free? If taking care of the children goes on until 11 p.m., see chapter 6, "Rhythm in Home Life." What is happening sexually between you? Can you set a time once a week to spend time together, just the two of you? Would learning more about early childhood help make your task seem more worthwhile and help engage your mind? Would a new activity, such as getting out to an art class, satisfy your need? Taking some time away can often improve your state of mind and your mothering. A friend who was a mother of five young children and lived by the airport got her pilot's license after the birth of her sixth child because within five minutes she could be hundreds of feet above all the dirty diapers and toys on the floor. In a similar vein, I took a course to become a travel agent when my children were two and a half years and six months. I see it now as one of the main things that kept me sane during a very difficult time. It provided intellectual stimulation two afternoons a week and was pure fantasy fulfillment (I never became a travel agent). 4. Do you feel at a loss for things to do with your child? One friend expressed her frustration by saying, "But I find doing puzzles so boring!" In general, we need to enjoy our children rather than be concerned about playing with them. By this I mean that we need to have a positive attitude and provide them with things to do, but we do not always need to do the same things they are doing. Think of ways to involve your toddler in the things you do rather than trying to get them done more quickly without her. Once your child is older than two and a half, invite other children over and let them play with one another. It requires supervision and judicious adult input, but it allows the child to be in his element rather than constantly requiring adult input to play. If you are still feeling dissatisfied, see whether you can discern why and discuss it with your partner or a friend. You don't have to settle for "getting through it" rather than enjoying parenting and being with your children. New knowledge and perspective, establishing rhythm and discipline, and understanding how children learn and play can all help you enjoy the adventure of parenting young children. It isn't always easy, but it's always worthwhile and rewarding. If you still have issues that haven't been addressed, you can skip to chapter 12, in which we consider additional parenting issues, such as television and screen time, immunizations, balanced development, preparation for life, and much more. Or write to me at my blog, www.waldorf inthehome.org; I'd be glad to respond! Beyond the Rainbow Bridge, by Barbara J. Patterson and Pamela Bradley (Michaelmas Press). 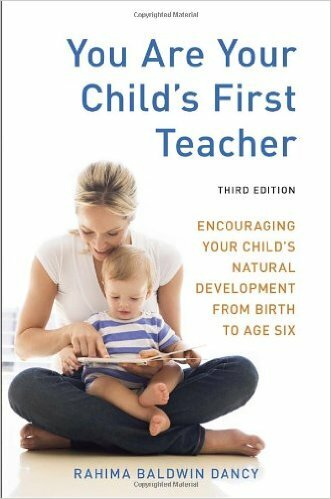 A Steiner-oriented guide to nurturing children from birth to age seven, with an excellent section on creating balance. "The Four Temperaments," by Rudolf Steiner, published in the book Rhythms of Learning (SteinerBooks). An introduction to the study of temperaments, which is a great help in parenting. The Incarnating Child, by Joan Salter (Hawthorn Press). Addresses parenting in the first two years from the standpoint of Steiner's indications and the author's wide experience at the Gabriel Baby Centre in Australia. "Joyful Toddlers!" Blog and telecourses from Faith Baldwin Collins, from her work as cofounder of Rainbow Bridge LifeWays Program. See www.joyfultoddlers.com. Lifeways: Working with Family Questions, edited by Gudrun Davy and Bons Voors (Hawthorn Press). Issues of family life growing out of discussions by a women's group working with Steineffs insights. Mothering and Fathering, by Tine Thevenin (Avery). Explores the gender differences in parenting and the value of both. Provides valuable perspectives if you find yourself constantly at odds with your spouse or pediatrician on parenting issues. Out of print, but available through Amazon. Nonviolent Communication, by Marshall Rosenberg, Ph.D. (Puddle Dancer Press). Also available are CDs and DVDs by John Cunningham on nonviolent communication and Waldorf, from www.waldorfinthe home.com. "Spiritual Parenting," by Joya Birns and Cindy Brooks. Book and three CDs on how discipline and communication change with children in the three seven-year cycles. Insightful and practical. Marshall Rosenberg, Ph.D., Nonviolent Communication: A Language of Life (Encinitas, CA: PuddleDancer Press, 2003). Harvey Karp, MD, The Happiest Toddler on the Block (New York: Bantam Dell, 2003). Margret Meyerkort, "Creative Discipline," in Davy and Voors, eds., Lifeways, pp. 214-23. Rudolf Steiner, Soul Economy and Waldorf Education (Spring Valley, NY: Anthroposophic Press, 1986), p. 121. Grunelius, Early Childhood Education, p. 29. Regina Sara Ryan, The Woman Awake (Prescott, AZ: Hohm Press, 1998). Tine Thevenin, The Family Bed (Garden City, NY: Avery, 1987). Norbert Glas, Conception, Birth and Early Childhood (Spring Valley, NY: Anthroposophic Press, 1972). Salter, Mothering with Soul, pp. 49—52. Wilhelm zur Linden, When a Child Is Born (New York: Thorsons Publishers, 1984). Michaela Glöcker and Wolfgang Goebel, A Guide to Child Health (Hudson, NY: Anthroposophic Press, 1984). Aletha Jauch Solter, Exercises in Self-Awareness for New Parents (Goleta, CA: Shining Star Press, 1984). Aletha Jauch Solter, The Aware Baby (Goleta, CA: Shining Star Press, 1984). Vimala Schneider, "Crying," Mothering, Spring 1987, p. 23. David Sobel, Waldorf Teacher Training Newsletter, Spring 1987, p. 5. Melissa Healy, "Study Links Good Daycare, Success in Early Grades," Sacramento Bee, June 9, 1999, p. A5. T. Berry Brazelton, Working and Caring (Reading, MA: Addison-Wesley, 1985). White, The First Three Years of Life, p. 272. Kim Boatman, "Parenting Guru's Push for Bigger Diapers Embraced by Consumers," Sacramento Bee, January 2, 1999.